The San Francisco Forest Alliance opposes the San Francisco Recreation and Parks Department (SFRPD)’s Natural Areas Program (NAP) for several reasons: Destruction of trees and other habitat for birds and animals; the use of toxic herbicides; and widespread access restrictions for residents and their families including their kids and pets. 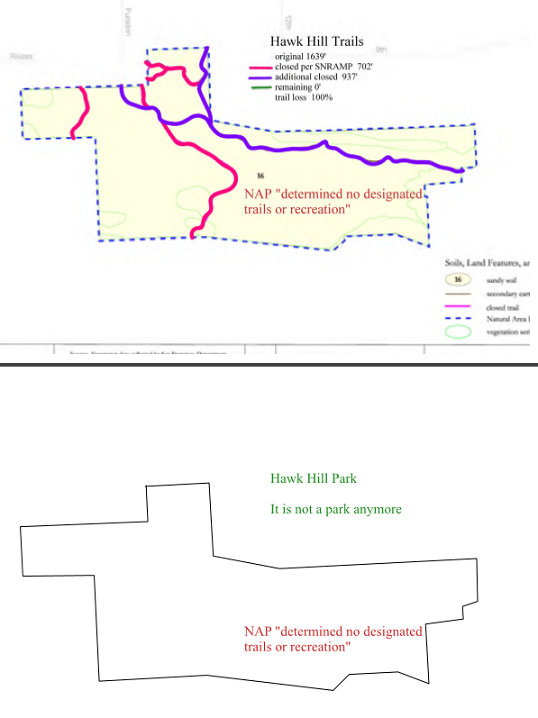 NAP is restricting parks to on-trail use only – which shrinks the parks to a fraction of their original usable size. 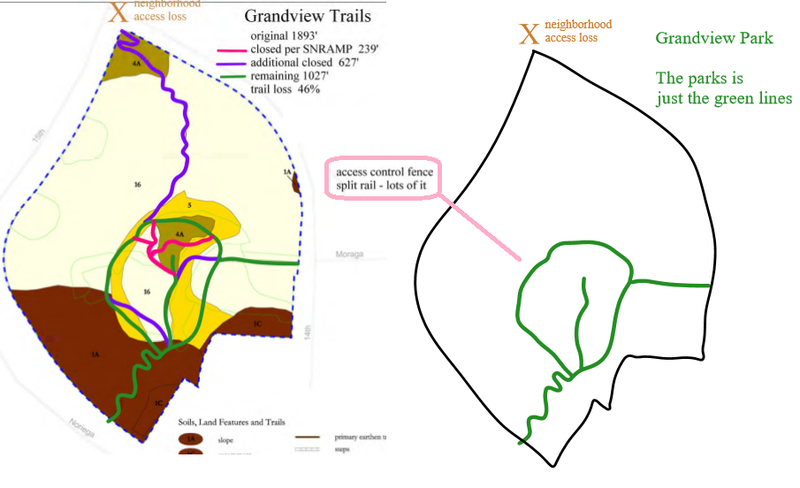 This article is about access – specifically, NAP is closing even more trails than disclosed in the Significant Resource Areas Management Plan (SNRAMP). In the SNRAMP, they said they were planning to close or relocate around ten miles of trail, which was bad enough. But recent actions by NAP show that they are actually closing even more trail than they disclosed in that plan, and that they have already started implementation – despite the Plan not being certified. The SNRAMP is not yet certified, and as such, should not be implemented until the certification is completed. This appears to be a violation of at least three regulations. Furthermore, this is all being done quietly. We were able to get actual maps of “designated trails” – but only for a few parks. This article by Tom Borden spells out the details. 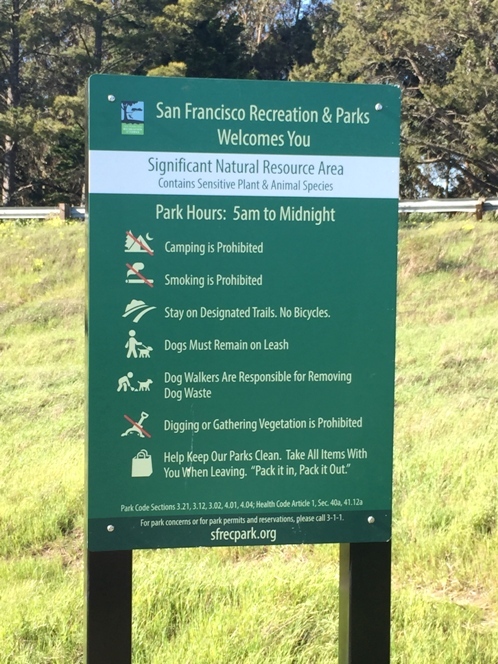 The signs cite Park Code 3.02, which states, “No person shall willfully disobey the notices, prohibitions or directions on any sign posted by the Recreation and Park Commission or the Recreation and Park Department.” Violations are punishable by fines of $100 and up. This means we can be fined for going off-trail or for using un-designated trails. 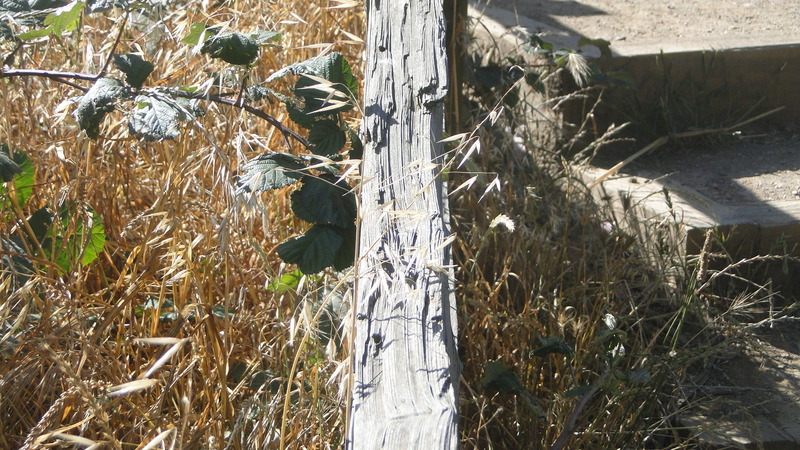 However, “designated trails” aren’t necessarily marked. How can we tell which trails are Designated and which trails are not? Does the Park Patrol know? Of course, the rule is pointless if nobody knows which trails are Designated and Actively Maintained. How would the NAP staff and contractors know where they are allowed to spray? How would the public know where it is safe to walk? 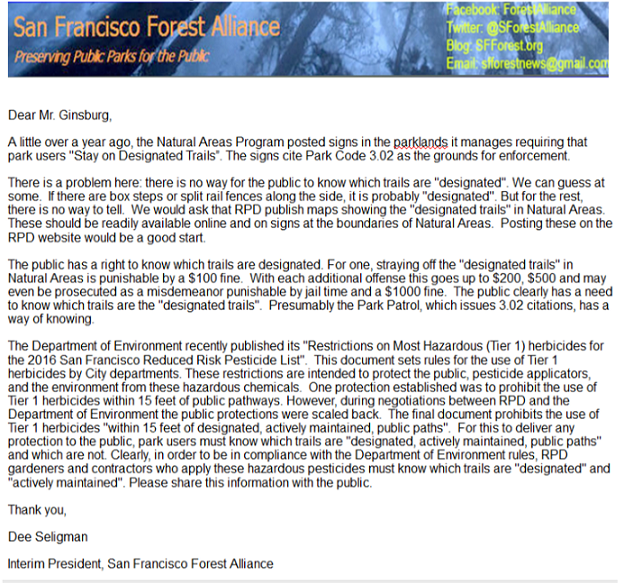 SF Forest Alliance also submitted a Sunshine request to RPD and was referred to the RPD website where maps for a few Natural Areas are posted. However, there are maps for only 8 of the 32 Natural Areas and two of those posted do not seem to be correct (McLaren and Lake Merced). Why won’t RPD’s Natural Areas Program provide maps of their Designated Trails? What are they hiding? The elephant in the room is the effective closure of 31% of our parkland to public access. NAP’s intent, and the meaning of the signs, is that our use of NAP-controlled parkland is limited to their Designated Trails. We may not leave those trails. The NAPs plans to close trails and limit the public to on-trail access only is disclosed in their 2006 Significant Natural Resource Areas Management Plan or SNRAMP. The SNRAMP proposes “enforcement” to keep people from wandering off-trail and as a “last resort”, the installation of fences. So far, they have skipped over enforcement and gone straight to fences. 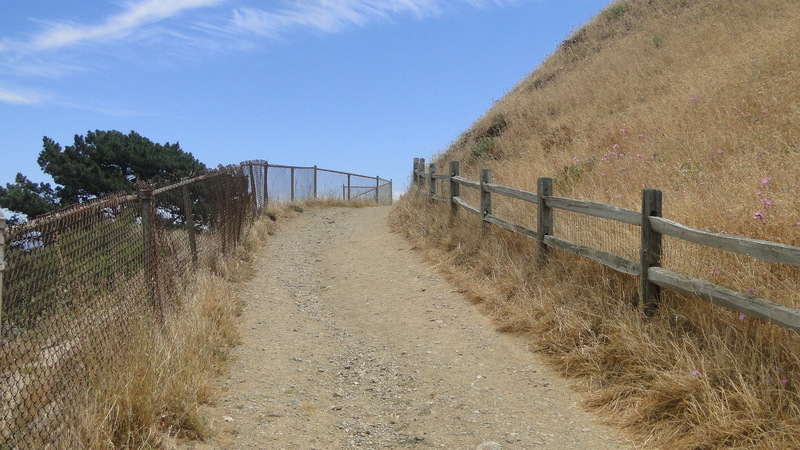 Grandview Park and Corona Heights have so many fences you feel like you are in a maze of cattle chutes. Implementation of the SNRAMP has serious environmental consequences and so the plan is subject to CEQA. An EIR for the plan has been in process since 2005 and has yet to be released to the Planning Commission for certification. In the next section are maps of the NAP areas where Designated Trails have been identified. For parks that have gotten the full NAP treatment, a tally of sharp cornered, splinter enriched, split rail, access control fencing is included. 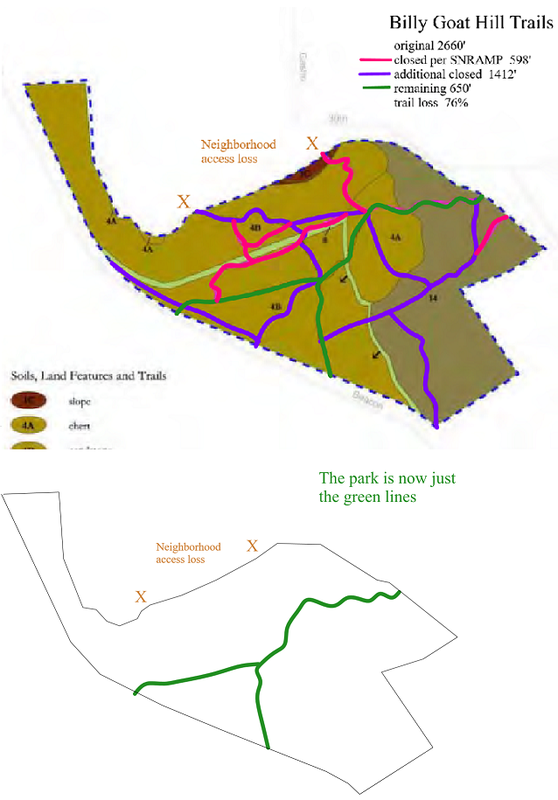 Notice how some of these trail closures cut off entire neighborhoods from their parks. The only public use of NAP parkland is along those green lines. The rest is off-limits. On the maps, trails are marked in three colors. The green trails are the Designated Trails where we are still allowed to walk. The red trails are ones identified in the SNRAMP as unwanted and planned for closure when the SNRAMP is implemented. It is now illegal to use those trails. The purple trails are identified in the SNRAMP as Designated Trails to remain open. However, the NAP has chosen to close those as well. 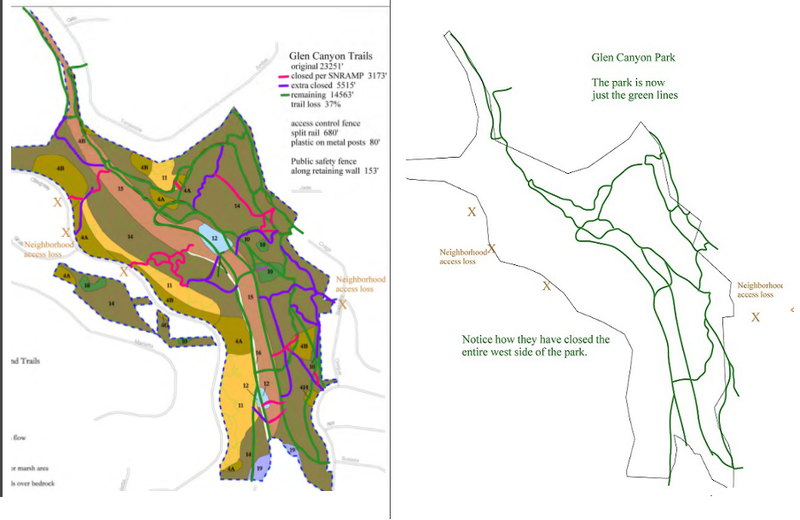 In some parks like Grandview, Glen Canyon and Corona Heights, the red and purple trails have been physically closed with fencing and piles of tree limbs. This has yet to be done extensively in the other parks mapped. For now the trails are closed by virtue of the signs, Park Code 3.02 and the maps posted on the RPD website. Don’t worry, the fences are coming. Each park map is followed by a skeleton map highlighting the tiny amount of parkland now open to the public. the colored areas show the usable space in the park. In all the “after” pictures, it’s just the actual – limited – trail. The SNRAMP states that 26% of the existing trails would be closed, leaving us with 30.8 miles of trail. Based on the information unearthed to date, the NAP is actually closing 51% of the trails in Natural Areas. If we extrapolate the actual closure rate to all of the Natural Areas, the 41 miles of existing and planned trails documented in the SNRAMP will be reduced to 20.9 miles. The loss in trails is nothing compared to the loss in actual parkland available to the public. 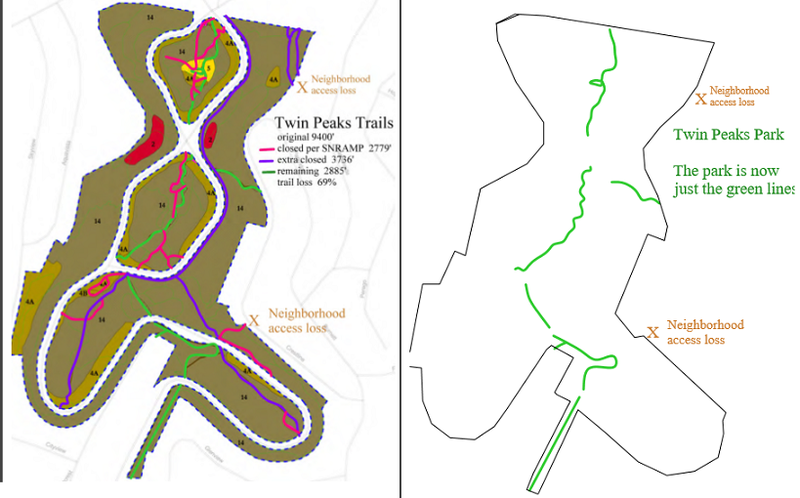 Assuming the average trail is 10 feet wide and the NAP only closes the trails disclosed in the SNRAMP (both very generous assumptions based on what we have seen so far), we can calculate how much parkland remains for the public. 30.8 miles of 10 foot wide trail only amounts to 37 acres. This is 3.4% of the 1100 acres available to the public before the new access restrictions. That is unacceptable. At the actual trail closure rate we will only be left with 25 acres. That is even more unacceptable, especially if your neighborhood park is a Natural Area. IS SFRPD ABOVE THE LAW? 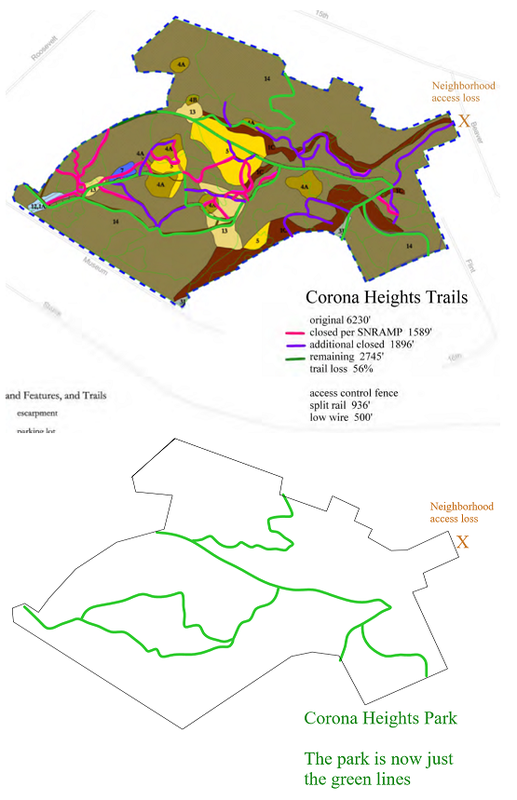 BOS resolution 653-024 which prohibits the NAP from imposing, “Trail closures, or restrictions on access and recreation” until the Board of Supervisors (BOS) has approved the natural areas management plan (SNRAMP). They have not approved the management plan. CEQA, PLANNING DEPARTMENT CASE NO. 2005.1912E. The SNRAMP Environmental Impact Report has not been certified by the Planning Commission, yet the NAP is implementing its plan. All of the trail closures, fences and signage are part of the SNRAMP. RPD is brazenly violating CEQA. City Charter Article IV section 4.113 RECREATION AND PARK COMMISSION: “No park land may be sold or leased for non-recreational purposes, nor shall any structure on park property be built, maintained or used for nonrecreational purposes, unless approved by a vote of the electors.” The signs and fences violate the intent of this, dramatically reducing the amount of parkland available for recreational uses. The parkland is not covered by a parking lot or a gift shop, but it takes away recreational space all the same. The Recreation and Parks Department seems to be operating outside the rule of law. It does not answer to the public or the Board of Supervisors. It appears more concerned with pleasing special interests than the public at large. Something needs to be done. I sugest the Forest Alliance SUE THEM. Perhaps we should start a social media event to raise money and hire LAWYERS! Rec and Park needs to reestablish its priorities – parks where things grow and are enjoyed by animals, including, but not limited to, humans. It is a shame what it has done now that it has money – the parks were better off when Rec & Park was last on the list for funding. Is there any group putting pressure on Rec & Park for transparency of their use of toxic herbicides in our parks? I could not find advance notices for where and when spraying will take place or historical records of use by park. With all the advances our city as a technology leader why are text alerts not being used to notify people who want to know this information so they can avoid walking in these areas? 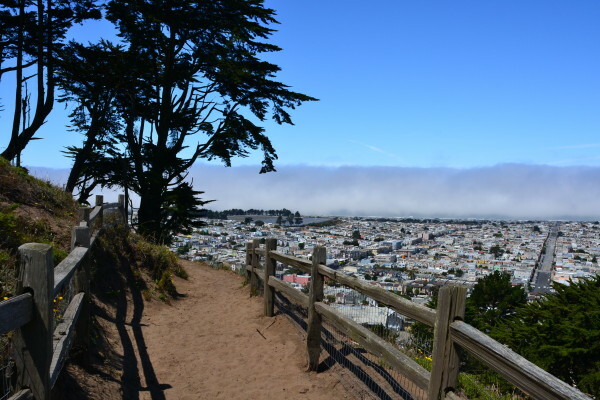 Why aren’t reports online so people can easily access information about the frequency and volume of spraying in specific areas like Billy Goat Hill where connector trails have been added? Thanks for your help.